The big story of this cruise is sea ice. As in, there isn’t any. At least not in our part of the Arctic Ocean. This year set a new record for lowest Arctic sea ice extant. So our odds of seeing any at this time of year weren’t good to begin with. Still, almost everyone who set foot on the icebreaker Healy was hoping to encounter some. Sadly we haven’t seen any ice aside from what’s frozen on the decks and windows of the ship. But the sea ice is growing fast now. 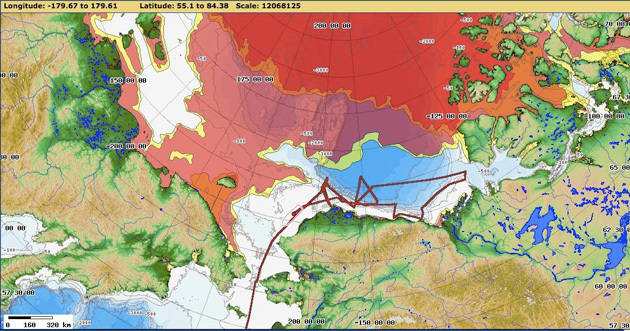 The top map shows sea ice extent in this part of the Arctic on 03 October, the day I arrived in Dutch Harbor, Alaska. This analysis comes from the National Ice Center (NIC). Pink areas suggest ice cover of 80 percent or greater. Yellow marks marginal ice formation. If you measure from due north of Point Barrow, Alaska, the ice front was roughly 440 nautical miles (506 miles / 815 kilometers) from land on 03 October. This next map shows the sea ice extent as of yesterday, 20 Oct 2012. On that day, according to the NIC analysis, the ice front reached to within ~133 nautical miles (153 miles / 246 kilometers) of Point Barrow. Averaged out, that out a growth rate of 18 nautical miles (20 miles / 33 kilometers) a day. Though in reality the sea ice advanced more slowly in the early part of the month and is galloping faster now. 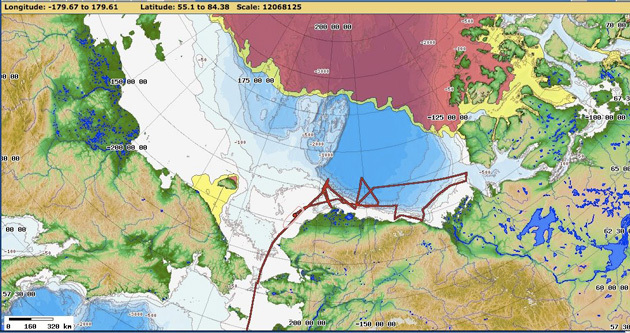 The red track line marks Healy’s meandering for the past two-plus weeks as we visit mooring stations and CTD lines across the Beaufort and Chukchi Seas.